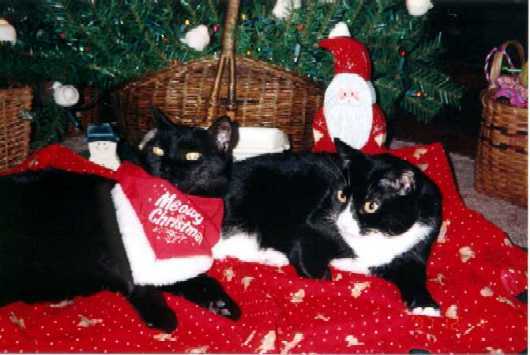 Cole aka Mommy's Handsome Boy or Bunny Bunny Boo Boo, is on the left (very debonair in the Meowy Christmas scarf.) He will be 18 in December. Cole is more like a dog in that he comes when you call him and he greets you at the door, etc. He's had me since he was a year old and a stray at a very busy intersection. I took in him to find him a good home (not mine) and the rest is history. Victoria aka Torie or Pamela Anna (she should have been blonde) is on the right and she was 8 in May. She is very busy at home napping in the sun, watching birds on the feeder and giving kisses to her big brudder, Cole. They would both like to meet Fozzie but I don't think that is going to happen.